Simple PLC PT100 RTD temperature measurement - Robert Owen Inc. 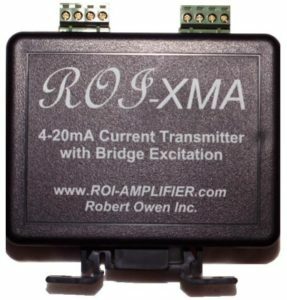 The Robert Owen Inc. ROI-XMA 4-20mA sensor transmitter, allows PLC PT100 RTD temperature measurement. Robert Owen Inc. temperature transmitters offer temperature ranges as wide as -200 to 500 Deg C or as small as 0 to 32 Deg C, depending on the make and model. The ROI-XMA-RTD works with standard PT100 platinum 100 ohm RTDs and converts the resistance to 4-20mA current loop format, making the measurement suitable for long distance transmission. With ROI-XMA; you can use PT100 RTDs with standard industrial PLC’s and industrial I/O. The ROI-XMA series of loop powered RTD transmitters, convert an RTDs temperature related resistance change into a standard 4-20mA instrumentation signal. Input RTD temperature sensor data, into your PLC; using standard 4-20mA, 0-20mA, 0-5Vdc, or 0-10Vdc input A-D channels. No need to replace working sensors, you can signal condition your sensors to make them compatible with most modern industrial control systems. Useful for interfacing existing HVAC and refrigeration system RTD temperature sensors, with modern industrial control systems. Accessories such as signal isolators and trend recorders are available. Did you know that you can send temperature sensor data directly into spreadsheets? Copyright © 2019 Robert Owen Inc.